Every year WATER PAGES, a Comprehensive Annual Directory exclusively catering to Water and Wastewater Industry is published by Water Today – The Magazine. 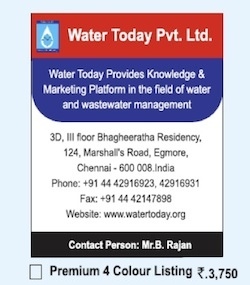 This annual directory is a massive and extensive compilation showcasing addresses, orientation and contact details of all the Indian companies catering to Water segment. 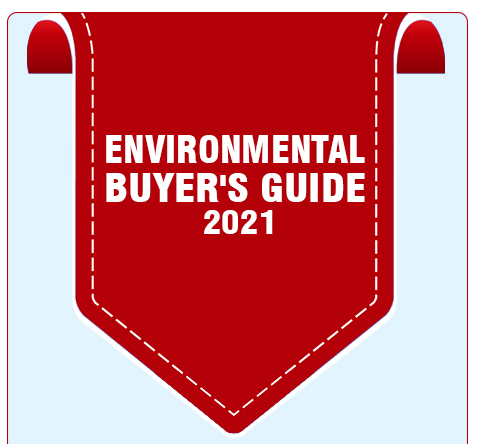 Water Pages is the perfect handbook within water industry. There are two options* of listing. Premium Listing: Option I is paid listing about your company’s information in the form of advertisement. You have two options to choose: Premium two-colour listing and Premium four-colour listing. 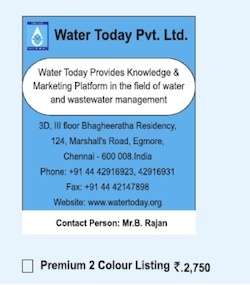 •	Presents unique business opportunities for water solutions service providers. * Please note that you can choose either of one option - Option I or Option II.